Chapati, sometimes also spelled chapatti or called roti, is an ancient unleavened flabread that's common in Indian, East African, and Caribbean cuisine. The basic recipe includes either all white flour or a combination of both white and whole wheat flour combined with salt, warm water, and sometimes a bit of fat. No leavening agent, either in the form of yeast, eggs, or chemical leaving, such as baking powder or baking soda, is used. The actual word, chapat, is Hindi for "slap," which is how the thin dough was traditionally made. It was slapped between the palms of wet hands, rotating between each slap. It's a popular form of bread on the Indian subcontinent and it was introduced to other parts of the world by immigrants, particularly merchants, who settled in Central and Southeast Asia, and the islands of the Caribbean. The exact diameter and thickness of chapati can vary from region to region and some households have specialized rolling pins and cooking vessels to make them. Some traditional recipes may leave out the salt so that the bread acts like a bland vessel for heavily spiced dishes. Or, sometimes grated cheese, radish, or turmeric powder is added to the dough for color and flavor. The kneading of the dough, and subsequent rest, is important to develop the gluten and make the dough light enough to puff and cook through. Some traditional Indian cooking methods call for the dough to only be partially cooked in the skillet and then put over an open flame to puff up the center like a balloon. Chapati, like naan and pita, is another example of the flatbreads that are popular throughout the Middle East, India, and Africa. Once cooked, they can be used as a vessel to hold food or dips or just spread with butter or ghee and served alongside a meal. Stir in the oil, butter or ghee and mix well. Pour in the warm water and mix to form a dough. Knead the dough for about 10 minutes, form it into a ball, and wrap with plastic. Set it aside to rest for about 1 hour. Divide the dough into 6 equally sized balls. Using a rolling pin, roll each ball out, on a floured surface, to about an 8-inch diameter. 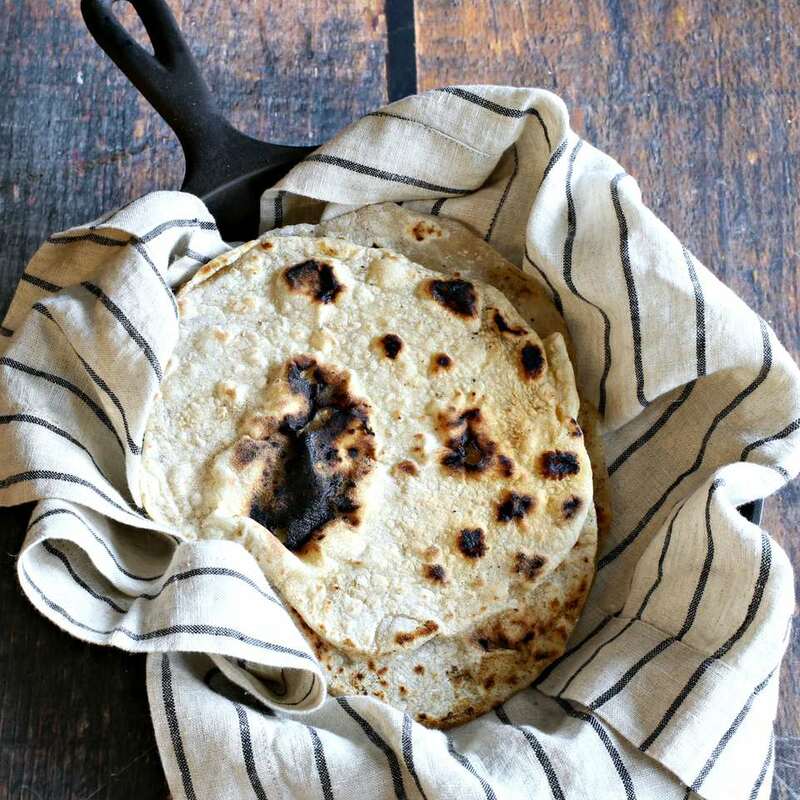 Heat a cast iron pan or another dry griddle and cook each chapati, one at a time, until browned and puffed, about 1 minute per side. Press lightly around the edges with a spatula to help help air bubbles form. Serve warm.